Assume very little about the 2019 MLS season. Week 6 saw the team that started the weekend with the worst record in the league win at home. The San Jose Earthquakes shutout Portland 3-0 at Avaya Stadium for their first points of the season. Shea Salinas scored in the 15th with Danny Hoesen doubling the lead in the 33rd. Cristian Espinoza made it 3-0 a minute later. Daniel Vega kept the clean sheet with four saves including saving Diego Valeri's penalty in the 56th. 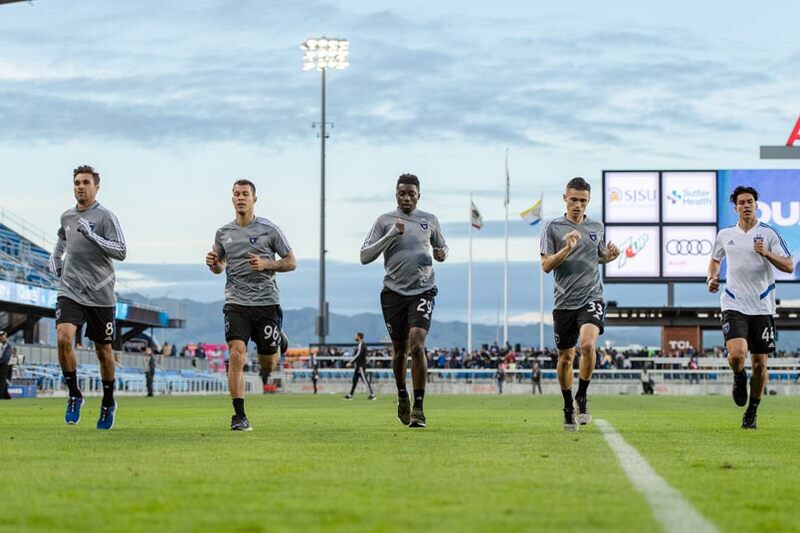 "It’s not easy to come from a lot of losses and play such an important match for everyone, above all since there were a lot of changes," San Jose coach Matias Almeyda said. "I’m happy for the fans that were able to celebrate this match and happy for the players and us since we dedicated a lot of time and passion to this." A meeting of two of the best teams so far only made the case for one of them with LAFC beating DC United 4-0 at Audi Field. DC goalkeeper Bill Hamid saved a Carlos Vela penalty in the 12th minute. It was Vela opened the scoring in the 15th minute and assisting on Diego Rossi's goal in the 27th. Rossi made it 3-0 LAFC in the 32nd. Wayne Rooney saw red for a serious foul in the 52nd with Rossi finishing off his hat-trick in the 76th. Tyler Miller made three saves to keep the clean sheet. "It’s great to win 4-0 away from home," LAFC coach Bob Bradley said. "We scored some really good goals. Today is a choppy game, so it’s not exactly a game where there’s all sorts of fluidity and everything else. The field is a bit choppy and slow, so I thought we handled it well. It’s hardly a day where we feel like we’ve arrived. We’ve got a long ways to go." On Friday, the LA Galaxy shutout Vancouver 2-0 on the road. Zlatan Ibrahimovic assisted on Daniel Steres's goal in the 63rd and scored in the 71st. David Bingham made five saves for the clean sheet including saving Ali Adnan's penalty in the 2nd minute. "We needed to do more. It was not enough," Ibrahimovic said. "If he scores the penalty, it would be a different game. In the second-half, we came out stronger. We were more confident, more stable in our game. I had the good chance where the goalkeeper gave it to me surprisingly and I missed, which I shouldn’t have missed. Then I score another one, it was offside. Then we have this thing with the VAR. If the referee makes a mistake, it can happen, we all make mistakes. But if you make a mistake by seeing the replay on the video, cannot happen." NYCFC and Montreal started the Saturday schedule by drawing 0-0 at Yankee Stadium. Montreal played a man down from the 70th minute with a red card to Maxi Urruti for a serious foul. NYCFC finished with 4 shots on goal to Montreal's 2. Toronto and Chicago split the points at BMO Field with a 2-2 draw. Jozy Altidore put Toronto up in the 31st minute with CJ Sapong equalizing in first-half stoppage time. Nemanja Nikolic scored for the Fire in the 62nd. Altidore assisted on Jonathan Osorio's equalizer in the 76th minute. "We were very close to bringing all three points back to Chicago," Fire coach Veljko Paunovic said. "But I think with this one point we need to be happy, and we are happy, but now we must prepare for back home against Vancouver. So it's going to be really important for us and really big if we can win that game against Vancouver." Minnesota beat New York 2-1 at Red Bull Arena. Abu Danladi scored for United in the 34th with Romario Ibarra doubling the lead in the 50th. Cristian Casseres scored for the Red Bulls in the 70th. Columbus shutout New England 1-0 at home. Josh Williams scored the game's only goal in the 42nd. The Revolution played a man down from the 64th with a red card to Michael Mancienne for unsporting behavior. Zack Steffen kept the clean sheet with 2 saves. Philadelphia came back to beat FC Dallas 2-1 at home. Reto Ziegler put Dallas up in the 10th with Cory Burke equalizing in the 85th. Alejandro Bedoya scored the Union's winner two minutes into stoppage time. Orlando beat Colorado 4-3 at home. Kei Kamara scored for the Rapids in the 9th minute with Nani equalizing in the 31st. Tesho Akindele gave Orlando the lead in the 33rd. Nicolas Mezquida equalized for Colorado in the 61st with Cole Bassett scoring in the 71st. Chris Mueller subbed on in the 80th and equalized a minute later. Nani converted an 89th minute penalty for the win. “It’s always good to score the goals for the team," Nani said. "All of it will help, but obviously not the most important. We wanted to win for our fans. What they’ve been doing all the weeks was fantastic. I never saw that in my life. I’ve played for many teams, and when things are not going well, everyone knows how the fans normally react. These fans, they are special. So I wanted so badly to win, to help the team win." Seattle shutout Real Salt Lake 1-0 at home. Nicolas Lodeiro scored the game's only goal in the 18th minute. Stefan Frei kept the clean sheet with four saves. Week 6 concluded on Sunday with FC Cincinnati and Sporting Kansas City drawing 1-1 at Nippert Stadium. Darren Mattocks put Cincinnati up from the penalty spot in the 19th minute with Gianluca Busio equalizing in the 62nd. Both teams finished with 4 shots on goal.